Signs reading "California Acorn Survey: Official Vehicle" in English and Spanish decorate the side and back of Walt Koenig's minivan. Each September since 1994, the ornithologist has traversed California, pulling over at places from Palomar Mountain State Park in the south to Shasta County in the north. Everywhere, Koenig and colleague Jean Knops—along with anyone else they can rope into the count—spend 15 seconds peering up at individual oaks to count acorns. They'll hit 20 to 80 trees per site, often visiting more than one site a day and stopping only for Koenig's favorite road food—cheap tacos from Central Valley taquerías. This annual acorn adventure is rooted in Koenig's expertise on the acorn woodpecker, a species he began studying here at Hastings Natural History Reservation in Monterey County. Standing beneath an enormous oak known as the Plaque Tree, Koenig repeats the woodpecker's waka, its greeting call, as the red-capped birds dart overhead. "They're very social birds," he says, fondly. These birds' social dynamics have held Koenig's fascination for nearly four decades. Acorn woodpeckers are cooperative breeders, living in large family groups in which several birds, often closely related, may become parents. Groups build enormous granaries to store acorns. Their family structure can be as complicated as a soap opera, with as many as seven breeding males, or three breeding females, or 10 helper birds included in a single group. Now Koenig and colleagues are studying how woodpecker paternity is divvied up among several breeding males—within a single nest of eggs, most offspring tend to have one father. Knowing who's who in any particular group requires climbing up to 40 feet into trees to study nest cavities, band birds and draw blood for genetic analysis, along with hours of observation. Each time a bird is banded, Koenig (who shares his name with the actor who played Chekov on Star Trek) and his team tell the bird, "Live long and prosper," and kiss it on the head before its release. "If you don't do it, it's considered bad luck," says postdoc Eric Walters. For 26 years, Koenig was a Hastings-based research zoologist with UC-Berkeley's Museum of Vertebrate Zoology. He and his wife, behavioral ecologist Janis Dickinson, raised their two children in a 1929 schoolhouse around the corner from the Plaque Tree. (A pet woodpecker, Lucia, gave an alarm call when visitors arrived.) 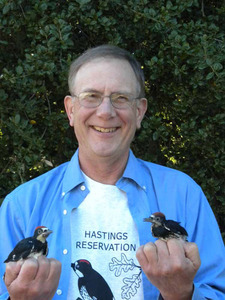 In 2005, Dickinson became the director of citizen science at the Cornell Laboratory of Ornithology; after their son "fledged" and left for college, Koenig followed Dickinson to a research job at Cornell, but he still spends as much time as he can at Hastings. A spark for Koenig's acorn count came as he wondered what his woodpeckers did during a bad acorn year. Long-lived oaks grow acorns by masting—pumping out lots of acorns at once in some years, none at all in others. During a good year, animals from mule deer to scrub jays (and, of course, acorn woodpeckers) gorge on the bounty from hundreds of millions of oaks across the state. As a result, California's acorn production has "a lot of implications for wildlife," Koenig says. He and Knops, at the University of Nebraska-Lincoln, have found blue oaks rooted nearly 400 miles apart producing acorns at almost the same time; the same phenomenon happens in valley oaks. Now, Koenig hopes to learn what factors drive this widespread synchronicity—and to learn more about his favorite bird. "I want to bring it back to the woodpecker," he says. Cameron Walker is a freelance writer in central California. Art historian Wanda Corn sheds fresh light on an enigmatic cultural icon. 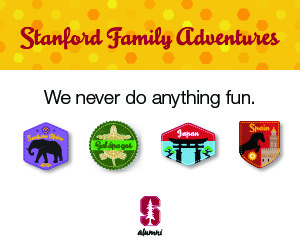 The Anderson gift puts Stanford in a whole new arts league.